Incredibly delicious roasted vegetable sandwich with creamy avocado mayo and goats cheese. Preheat the oven to 180°C. Cut the red pepper into wide slices and place on a baking tray. Drizzle with 1 tbsp of olive oil and rub all over the pepper to make sure it's all coated then season with salt and pepper. Roast for 10 minutes then turn the pepper slices over and bake for another 3-5 minutes until soft and slightly charred.Let cool. Meanwhile heat a griddle pan on a medium heat. Cut the aubergine into thin slices and brush each slice with the remaining olive oil. Place the slices on the griddle pan (you'll probably need to do this in batches) and griddle each side for around 1-2 minutes until cooked through and nicely charred.Let cool. To make the avocado mayo place the avocado, lemon, garlic, a pinch of salt and pepper and a small handful of basil in a bowl. Using an immersion/hand blender blitz until smooth ( you can also use the small bowl attachment of a food processor). Add the tbsp of sour cream and mix until combined. Taste and add more seasoning or lemon juice if required. Toast the slices of bread on each side by brushing with olive oil and placing on the griddle pan or use a grill. 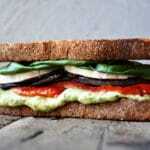 Once toasted thickly spread one slice of bread with the avocado mayo, top with a few slices of red pepper and aubergine. Add a layer of goat's cheese or whatever cheese you prefer then layer a few large basil leaves.